If someone asked you to name 5 facts about swimming in the United States off the top of your head, would you be able to? It is actually a lot harder than it seems! So let’s look at 5 fascinating facts about USA swimming! 65% of people in the U.S. don’t know how to swim. This fact blew my mind! I had no idea so many people don’t know how to swim! This was the most shocking I found, in my opinion. I found this to be quite surprising, as I thought all swimming instructors and life guards had to be certified. The largest outdoor heated pool in the United States was the Fleishhacker Pool in San Francisco which was open from 1925 to 1971 and was so big the lifeguards patrolled the waters using kayaks. Swimming is the fourth most popular recreational activity in the United States. It’s also the most popular recreational activity for children and teens (ages 7-17). Everyone loves the bikini swimsuit. And it wasn’t invented that long ago! The bikini swimsuit was named after a U.S. nuclear testing site in the South Pacific called Bikini Atoll. Those were the 5 most fascinating facts about swimming in the USA that I could find. I bet these will make you think differently the next time you’re about to jump in the pool. 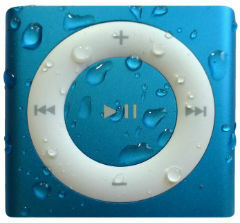 And speaking of jumping in the pool, make sure you don’t forget to grab your Underwater Audio Waterproof iPod filled with your favorite songs, before heading into the pool! What are some fascinating facts you know?